De-dog your home in 20 minutes flat! You're over-run with dog toys, tripping over them en route to the bathroom and almost wiping out on that under-foot tennis ball while serving dinner. Sort through those toys, throwing away all the hopelessly destroyed/completely hideous ones and saving the ones requiring a quick bit of re-stuffing/stitching up. But be realistic here—only save them if you will actually fix them. That done, leave out your dog’s current five favourites in a neat small bin (Ikea to the rescue!) and stash the rest of her toys in a small basket in the closet. Rotate the toys she has out every two weeks to keep them fresh and interesting. You have TONS of toys? Take a selection of gently loved ones and donate them to your local animal shelter. Good karma! Again, prevention. If your dog is allowed on the couch (or not allowed but you don’t seem able to deter her), make life easy on yourself. Procure a nice throw and drape it over the area your dog favours. Then simply toss in the wash once a week. Much easier than cleaning upholstery! If you are combating an existing fur build-up on your upholstery, buy a squeegee with a rubber edge and squeegee your furniture. The fur will literally roll off the material. It even pulls ultra short fur, such as that of Dobermans and Dachshunds, that weaves itself into the fabric. Now that you’ve dealt with the dog toys, let’s tackle the stray papers. Label a single file folder for all of your dog’s documents, vaccination papers, etc., and store in a drawer or filing cabinet. A moment’s work for clear counter space! Dog hair in the carpet. If your dog has longer fur, buy a small plastic garden rake and quickly rake your carpet before vacuuming. A quick rake will get up the bulk of the fur, making vacuuming faster and prolonging the life of your vacuum by reducing the amount of long fur wrapping around the roller bar and causing belt breakage. If you’re in possession of a Dyson vacuum cleaner (a girl can dream! ), consider getting the Dyson Mini Turbine Head attachment ($80), designed specifically to remove pet hair. It rolls the dirt and hair into balls for easy removal—more amazing than it sounds when you see it in action. It attaches to all upright and canister Dyson vacuums except the DC24 and cordless models. Or, let Roomba do the vacuuming for you. For a cool $329 (or $699, if you choose the top of the line model), this little robotic vacuum will make the rounds for you, navigating the house via its internal sensors and software. Never vacuuming again for a mere $329? Sounds like a steal to us. It’s a brave new world. Go CSI on your carpets. Eliminate old accidents—purchase an ultraviolet light, also known as a black light (available at Walmart for just under $20, as well as at most hardware stores). Turn your regular lights off, and shine the black light over your carpeted areas. Stains will quite literally jump out at you (yikes). Mark the spots in need of cleaning by placing a shoe or other object on top or demarcating with a piece of string, so you can locate the spots once you turn the lights back on. Treat with the eco- and pet-friendly stain remover of your choice—we the like non-toxic and biodegradable Get Serious! Pet Stain, Odour, and Pheromone Extractor that works in just three minutes flat—and reclaim the floor as a non-scary place to practice yoga. For all non-carpeted surfaces, Little Germs Organics (sleepypod.com) are effective, 100 percent organic, naturally antiseptic and antibacterial deodorizing cleansers that are safe to use around pets and children. Natural essential oils, like lavender, mint, and grapefruit mean they smell great, too. That tangle of leashes by the front door? Pare down to your favourites. The smelly frayed one? Throw it out. The one that’s not long enough for your liking and thus practically brand new? Donate it to your local shelter along with those surplus dog toys. That accomplished, screw a nice looking leash hook into the wall and hang the few remaining leashes there. For cool entryway solutions, check out These Creatures’ leash wall-hooks (thesecreatures.com). It’s all about prevention. Keep a dog towel by the front door to wipe off wet or muddy paws. Microfiber dogs towels made specifically for this purpose, such as the Soggy Doggy Super Shammy (soggydoggydoormat.com), are the bomb. Also take this opportunity to remove any dry leaves and twigs from your dog’s coat before they are tracked inside. With the Roomba on the scene, your dog just might have to fight to maintain his best friend designation. The Roomba robotic vacuum tackles all floor surfaces using high-tech software and sensors to choose from dozens of behaviours over 60 times per second (! ), adapting to the room and dirt around it and enabling it to clean every part of the floor. Using acoustic sensors, it detects dirt so that it can focus it’s cleaning on the dirtiest spots, following walls to clean to the edge of the room and navigating around furniture and clutter. It has sensors to keep it from falling off stairs and other cliffs and can even tell the difference between hard barriers (walls) and soft barriers (curtains, bed skirts) so that it can go under beds and couches—yes!—and is able to avoid getting stuck on chairs, cords, and carpet fringe. The newest member of the family, the whisper-quiet Mint Plus, is designed to clean uncarpeted floors with the same ease and efficiency. Welcome to the future. Check them out at iRobot.com. Hello Modern Dog, this post must have been written for me and my mutts. I was just stressing with problem 3. I have 6 dogs to care for and a simple vet visit can stress me out trying to remember what previous care each dog has received. Thanks to Modern Dog's article on dog allergies I was able to remedy problem 4. I now add the dog supplement VitaHound to all our dog's diets. Their itching and shedding has been dramatically reduced. Modern Dog has become me and my dog loving friends go to for raising healthy dogs, now I need a source for the kids. 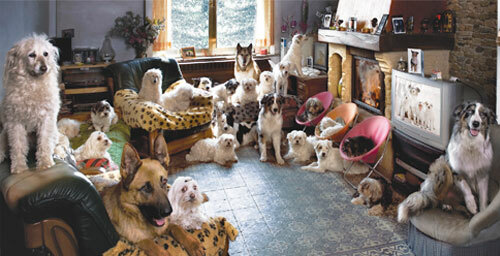 Comforting to see others crazy enough to own numerous dogs. Add my vote for the VitaHound dog supplement. Our dog’s itching and scratching was real concern, even though only 2 of our labs experienced severe food allergies, their vet bills broke the budget. Beyond Modern Dog’s dog health articles visit www.vitahound.com their info helped me out.